Stratasys has been involved with the 3D printing industry for over 25 years and has been one of the most influential companies in the 3D printing world. They are a relatively large company and operate in multiple industries such as healthcare delivery solutions, aerospace, the automotive sector and even education. Despite the size of the company, they continue to remain aggressive and continually look for new opportunities to acquire other operations and develop new products. In fact, they purchased MakerBot just two years ago in 2013 and continue to actively seek acquisitions in other sectors as well. They consistently have tested the limits of possibility in the 3D printing industry since 1994 when they introduced the very first thermoplastic that could be used with 3D printers. About eight years later, they unveiled the very first 3D printer with a price tag of under $30,000. They are clearly considered a leader in the 3D printing market and offer a wide range of products and services with a reputation for quality and innovation. In the following Mojo 3D printer review, we’ll break down the key “pros” and “cons” of the device. Recommendation: Is the Mojo Worth it? Among their many products is the recently released Mojo 3D Printer, a high-quality printer designed to offer professional grade 3D printing in a unit that is sized to fit on a desktop. 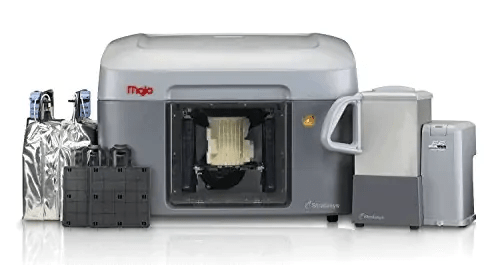 The Mojo offers a wide range of capabilities with a focus on ensuring accurate printing for prototypes and concept products, a good fit for many designers and engineers. This 3D printer is not designed for those who are new to 3D printing and just looking for a unit to learn the basics of 3D printing. It is intended for use in a commercial or industrial capacity and claims to offer product quality that is similar to what injection molding can produce. Whether or not it actually holds up to those claims may or may not be another story. Let’s take a look at the features and benefits of the Mojo 3D Printer and see what kind of value and production it can offer. The Mojo 3D Printer is the size of a normal desktop computer printer with measurements of 25 x 18 x 21 inches and weighs in at just over sixty pounds. In fact, if you placed it on a store shelf with traditional desktop printers it looks very similar. The Mojo Starter Package comes with all the components and supplies needed to achieve optimum printing results, unlike many other 3D printers that really only reach their potential if you use add-on components or replacement parts. The unit comes fully assembled and does not require a lengthy or complicated setup process. The initial setup is actually very similar to a traditional desktop printer, simply plug it in and run the system software for auto configuration. While some 3D printers only come with a heated build area, the Mojo has a fully enclosed chamber that is heated. This assists in keeping the temperature of the printing environment at exact specifications which helps improve the print quality. The Mojo uses FDM Technology which prints products using heat and applying layers of thermoplastic filament one by one. This method is very effective for creating products that are very detailed or have elements of their design that are particularly complicated to print. FDM provides excellent detailed printing but has other benefits as well, such as ease of use and it provides a very clean printing process. Additionally, it helps produce components with a high degree of structural integrity and the process is relatively quiet which makes the Mojo a perfect fit for office environments or design studios. The printer is capable of producing products that are both structurally and mechanically sound, which means you can print objects that have moving parts such as a chain. The software that comes with the printer is called Print Wizard and is a very user-friendly piece of software that controls all aspects of controlling the printer and printing process. It allows you to choose up to nine different colors, gives you 3D views of your product and the graphical user interface is intuitive and easy to navigate. The Mojo is a unique package that offers professional grade 3D printing that is capable of producing fully functional prototypes and a wide range of products with excellent quality. It is fully capable of operating as a main printer on a daily basis and you do not need any custom ventilation or a specific work area, it can simply operate on your desktop like any other printer would. For printing prototypes and detailed designs the Mojo can hold its own compared to any other printer in its price range. The printing action is smooth, precise and surprisingly fast for such a small unit. There is no requirement for special ventilation and the printing process is relatively quiet compared to other 3D printers, so this unit is ideal for a professional office setting that needs to print prototypes or similarly detailed products. The tradeoff for enjoying the small size of the Mojo is it may not hold up well if you are consistently printing large volumes of products. Because the unit is the size of a desktop printer that means all of the internal parts have to be smaller as well. While there are not any direct quality issues reported about the Mojo, it is just a fact of life that smaller parts are probably a bit less sturdy than some larger printers have and are not going to hold up as well over the long-term. Compatible with Windows XP,7,8,10 Weighs 60 LBS. The unit comes with a one-year warranty that covers the parts and labor required to repair the unit back to its original operating condition. You can also opt for an extended warranty through Stratasys as they offer several options. The WaveWash 55 is an integral part of the process for printing with the Mojo. It cleans off the parts once the initial printing process is complete and delivers a refined, clean product. The cleaning system is easy to use, requires no water connection or plumbing of any kind and is extremely efficient. The system uses a water-based solution to dissolve leftover support materials without the need for additional cleaning by hand. Users can simply drop a finished part into the WaveWash 55 and it will produce a clean and ready fully functional product with all support material remnants removed. The Mojo is a unique 3D printer that packs a lot of power and excellent print quality into a small package. The quality is on par with other printers in its price range and the size as well as the cleanliness of the print offers some significant advantages. The Airwolf Evo 3D Printer Review – Is it Worth the Hype? Raise3D N2 Review: Should You Go For It?